Washington State Retirement Communities. Washington is the north-western most state of the contiguous United States. Its northern border lies mostly along the 49th parallel, and then via marine boundaries through the Strait of Georgia, Haro Strait and Strait of Juan de Fuca, with the Canadian province of British Columbia to the north. Washington is bordered by Oregon to the south, with the Columbia River forming the western part and the 46th parallel forming the eastern part of the southern boundary. To the east, Washington borders Idaho, bounded mostly by the meridian running north from the confluence of the Snake River and Clearwater River (about 116°57′ west), except for the southernmost section where the border follows the Snake River. To the west of Washington lies the Pacific Ocean. Washington was a Union territory during the American Civil War, although it never actually participated in the war. Washington is part of a region known as the Pacific Northwest, a term which always includes Washington and Oregon and may or may not include Idaho, western Montana, northern California, and Alaska, depending on the user’s intent. 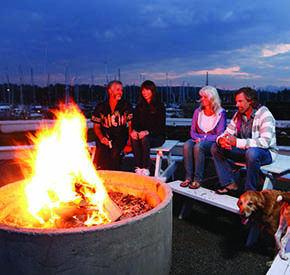 Explore Washington State Retirement Communities and find golf resorts, single family homes, retirement homes, golf course communities and mountain communities. Retirement property is key to living an ideal life. Find the right private communities that fit your needs. These beautiful Washington private communities and retirement communities could be your final residence. Explore planned communities and golf course communities. Retirement property is important, why rush the decision? Golf resorts.